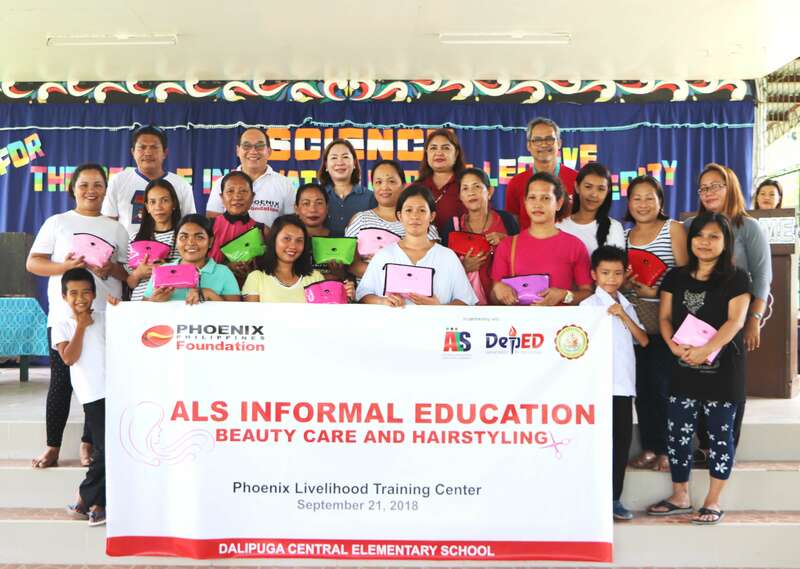 Enrollees of the Beauty and Hairstyling course offered at the Phoenix Livelihood Training Center at Daligupa Central Elementary School in Iligan City receive their starting kits from Phoenix Petroleum during the launching of the training center on September 21, 2018. Phoenix Petroleum, through its corporate social responsibility arm, Phoenix Philippines Foundation, continues to uplift the lives of Filipinos as it opened the company’s third livelihood training center on September 21, 2018 at Daligupa Central Elementary School in Iligan City. A total of 25 mothers who usually spend their whole day at the school to look after their children, signed up for the beauty care and hairstyling course, the first course offered at the training center. Alternative Learning System is a free livelihood education program of the Department of Education, implemented with the support of institutions like Phoenix. With three ALS schools—F. Bangoy Central Elementary School in Davao City, Banisil Central Elementary School in General Santos City, and Daligupa Central Elementary School in Iligan City—Phoenix helps fuel the dreams of more Filipinos by sponsoring the salaries of instructors, providing training facilities and equipment, allowing students to study various courses for free such as welding, plumbing, electrical installation, maintenance, computer servicing, and beauty culture and hairstyling. Education is one of the main thrusts of Phoenix Philippines Foundation and, over the years, it has helped Filipinos by providing them with sustainable livelihood opportunities. From education to environment, health, safety, and outreach, Phoenix Philippines Foundation is committed to support the needs of the communities it serves. It has been an active partner of people and institutions to develop, protect, educate, and empower less privileged members of our society, and as an active partner of communities, it continues to give back through initiatives designed to elevate their quality of life.